It seems we’ve been kind of in a funk lately. Not much new cooking going on, but that all changed tonight! -s got an awesome new cookbook for Christmas called The Kansas City Barbeque Society Cookbook, and when I browsed through the book a number of recipes popped out at me. So tonight -s made the Best Spaghetti Sauce Ever recipe (p. 97), and it didn’t fall short of its name. It was fabulous. -s made a few changes, which are noted in the recipe. We’ve never made a sauce with 2 whole cans of tomato paste, but the tomato paste plus the simmering for hours had delicious results! 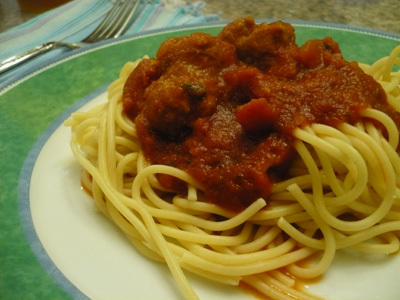 Recipe adapted from the Best Spaghetti Sauce Ever Recipe. In a large pot over medium high heat, brown the sausage with the onion and garlic. Add the tomatoes with their juices, tomato paste, tomato sauce, and water. Mix well. Add the basil, parsley, brown sugar, salt, red pepper (omitted), and black pepper. Bring to a boil, reduce the heat and simmer for at least 1 hour. We simmered for 3 hours.